“Ah si, ben mio, coll’essere io tuo, tu mia consorte, avrò più L’alma intrepida, il braccio avrò più forte. Ma pure, se nella pagina de‘ miei destini è scritto ch’io resti fra le vittime, dal ferro ostil trafitto, fra quegli estremi aneliti a te il pensier verrà, verrà, e solo in ciel precederti la morte ea me parrà!” – Manrico from Giuseppe Verdi’s Il Trovatore (The Troubadour), Libretto by Salvatore Cammarano, first performance on January 19, 1853 at Rome’s Teatro Apollo, based on the play of the same name but in Spanish, El Trovador, by Antonio García Gutiérrez English Translation: “Ah, yes, my love, when we belong each to the other, my courage will be the greater, my arm will be the stronger. But if within the book of destiny it is written that I should fall tomorrow, struck down by an enemy blade, in those dying moments my thoughts to you will fly, and I will know that I but go before you into heaven!” This is my Pride Month art trade with my very dear friend, fellow DeviantArtist, and Brickercup-shipping soul sister and comrade-in-arms, the ever fabulous, ever awesome, and ever fun Paula aka BrickercupMasterX3. I once requested her to draw my Soul Calibur OTP Siegfried/Kilik. 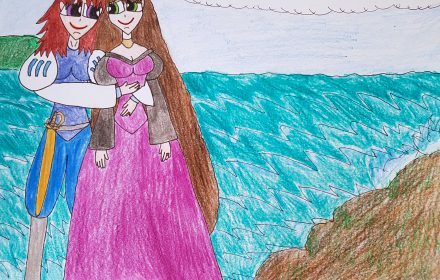 In return, she requested me to draw her OCs, Nicole the auburn-haired young lady with dark violet eyes in a blue and white prince’s outfit with the saber by her side and silver boots and Aalyiah the girl with long brown hair and green eyes, a golden necklace, a black and violet dress, and golden slippers. Plus, I even added a little something in the form of ruby rings, as in this picture Nicole and Aalyiah are engaged. Fulfilling my end of this art trade was easier said than done, as I had other obligations to fulfill and OTP and BroTP ships to draw, nudge nudge wink wink Brickercup, Blossutch, Bunnitch, and Boomubbles being my OTPs and Brickubbles being my main BroTP for life, as it was Brickubbles month. Moreover, I was figuratively banging my head, as to how I can make these two girls not only attractive in a lovey-dovey way but what setting I can place them in as well as what theme can I give to them and the overall feel if you know what I mean. Finally, I came to this wonderful idea. We have Nicole being akin to a fairy-tale prince and Aalyiah being the fairy-tale princess that she is, as they are having a romantic moment together on a cliff overlooking the sea on a nice, fair day with blue skies. Growing up on fairy-tales and still loving them to this very day as well as loving the fantasy romance yuri shoujo anime Revolutionary Girl Utena has inspired me to make something like this. As for the song choice, or more appropriately opera aria choice, I decided to pick Manrico’s Romanza “Ah Si, Ben Mio” from Verdi’s Il Trovatore, as it has a beautiful, sweeping, and at times haunting melody which makes it ideal for anything romantic. Now, what happens after this Romanza is Manrico, the titular troubadour, and Leonora, a noble lady and the object of his and the Count of Luna’s love, are about to get married until his vassal, Ruiz, alarms Manrico that his supposed mother, Azucena the gypsy woman, is about to be executed, as she is captured by his rival, the Count of Luna. This causes Manrico to break out in the cabaletta “Di Quella Pira” (Of that pyre), which is very famous for the tenor hitting the High C, even though that is interpolated but has become a tradition for many a tenor to attempt this. There is no need to worry in terms of Nicole and Aalyiah’s moment, as there will be only peace and calm between these two ladies. In order to accompany this picture, I personally think that Jussi Björling’s rendition of this particular Romanza is my cup of tea, as his voice was and will always be seamless, gorgeous, and well-focused as well as emotionally poignant. As someone who also sings, I totally look up to Herr Björling as a role model. So, without further ado, here is his rendition of Manrico’s Ah Si Ben Mio with conductor Renato Cellini along with the RCA Victor Orchestra and this was recorded back in 1952. Happy listening. Well, Paula, I hope you enjoyed this picture of Nicole and Aalyiah as much as you also enjoyed listening to the aforementioned opera aria. Take care and see you on the flipside. Nicole and Aalyiah belong to BrickercupMasterX3.